Topic: I got a Pinball Machine! I got a Pinball Machine! like the back glass and table graphics. You have to manually configure the playfield and backbox to fit the monitors. The end result is pretty cool! dbeeks1 wrote: This is going to be good! Will you be building a back box to house the small monitor? Metal side rails and red illuminated buttons would have me drooling! I have some tricks in mind, you will just have to wait and see! taellik wrote: The site is sloooow! Takes a while to go thru the Forum / post messages, etc. Also, not able to post "Shout" messages. 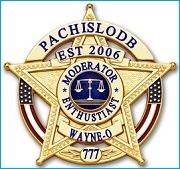 Pachislodb is on a shared server, so that why its slow. And as for the shouts only moderators and the Great Pachi King Chris are allowed to use it! Some very good info Gman! I'm hoping to pick up a pinball soon and I assume it will be one that needs repaired in some way. I'm looking for something late 70's early 80's. I think the guy that emailed me will not reply again. I'm not sure why he emails people and never replies? METZ wrote: so what happened devo? Nothing Happened I didn't get an email back! I hope things work out with yours! I have future pinball for now to help hold back some of the tears! Sounds like a good deal! Good Luck in your auction. Yeah it does seem odd and he never did email me any pics. He also said it was from the mid 80's? I think the machine is from 1978?